The Raleigh Motus Grand Tour Electric Bike is Ideal for that commute to work or a leisurely ride around town. Equipped with the new Bosch Active line plus mid motor offering an almost completely noise free experience and a higher level of pedal rate detection to improve cycling efficiency so you can get the maximum enjoyment out of your journeys. Comes in a choice of frame sizes and either derailleur gears or hub gears. 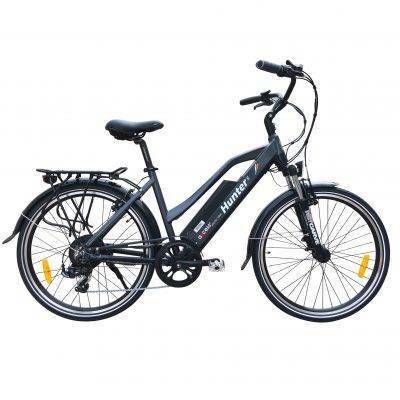 The Raleigh Motus Grand Tour electric bike Low Step is Ideal for the leisure rider or commuter. Powered by a semi-integrated 36 volts 400wh lithium-ion battery. This gives an impressive range of up to 110 miles* per full charge. The handlebar mounted Intuvia Display display delivers a complete range of information including a battery indicator, management of four power support modes including a walk-assist function (taking the bike up to 4mph), LED lights front and rear, a tripometer and speed indicator. The brand new Active Line Plus motor offers an almost completely noise free experience and a higher level of pedal rate detection to improve cycling efficiency so you can get the maximum enjoyment out of your journeys. Suntour suspension fork, suspension seat post, adjustable handlebar stem, a traditional bell and a wheel lock for added security all make for fantastic comfort and convenience. Available in a low step frame style makes getting on and off the bike much easier. With a comfortable upright riding position ideal for long rides or commuting to work. The almost completely noise free Bosch Active line Plus mid motor gives smooth acceleration combined with either Deore 10 speed or Nexus 8 speed gearing covering every base with a broad range of gears for every situation. Braking is covered by Shimano M315 hydraulic disc brakes, whilst CST ebike specific Zeppelin tyres keep your wheels firmly planted to the road. I bought the Raleigh Motus Grand few months ago from Espokes. The bike is great and fun to cycle. Gear change and power assist change is very smooth. I am glad I bought a Bosh motor and the battery pack. The LCD control unit is very easy to use – just click up/down to select the level of power assist from the motor. Espokes is a family run bike store and they are very friendly, helpful and knowledgeable on e-bikes, their specialty. I was bale to try several other bikes before deciding on the Motus. I bought the Raleigh Motus Grand Tour a few months ago in anticipation of retiring and hoping to get out and about in the beautiful Hampshire countryside. But, as I live in a hilly part of the County, I wanted some assistance when needed. This bike has been a great buy. Well-made, well-equipped, comfortable, and easy to use. Best of all, it has tamed those daunting hills with very smooth gear changes and four levels of assistance. Not the cheapest electric bike on the market but, as with many things, I suspect you get what you pay for. At least I won’t have to spend a fortune on Lycra as I just grab my helmet and go.